Journal of Tour Guiding (JOTOG) is a peer-reviewed journal that aims to contribute to knowledge and development of tour guiding field by publishing studies with academic and scientific qualities in the field of tour guiding. Journal of Tour Guiding (JOTOG) also aims to initiate a specialization among tourism journals with focusing solely on tour guiding studies. Besides, JOTOG accepts articles on tourism policy developments on tour guiding and other fields which have inter- disciplinary contributions. In this respect, the journal also includes studies on trends in tour guiding and discussions of current and future influences on tour guiding, focusing on new developments and developments in other fields thanks to its interdisciplinary nature. Additionally, JOTOG aims to follow a publishing policy that prioritizes the concept of up-to-date in the field of applied and theoretical studies. Furthermore, the journal also takes reviews of tourism representatives on tour guiding into consideration for publication. 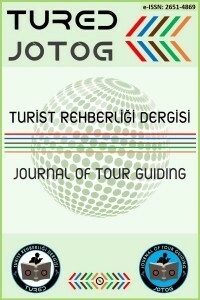 Journal of Tour Guiding accepts articles in both Turkish and English for publishing. Accordingly, authors willing to send a Turkish article to journal must supply structured abstracts in both languages in line with the journal’s structured abstract format. On the other hand, authors who send articles in English can get help from editorial board for free Turkish structured abstracts.